I’m here, honest! My brain insisted that I had to finish the last sleeve of the current cardigan before I posted, and lo, I just did. Of course, the second I pull up WordPress, my kiddo wanted something, ha ha. But that only stalled me a minute, so. With a bit to spare! So yes, pieces all laid out in the vague shape they belong — huttah! There’s still the collar to knit, as well as the button band. 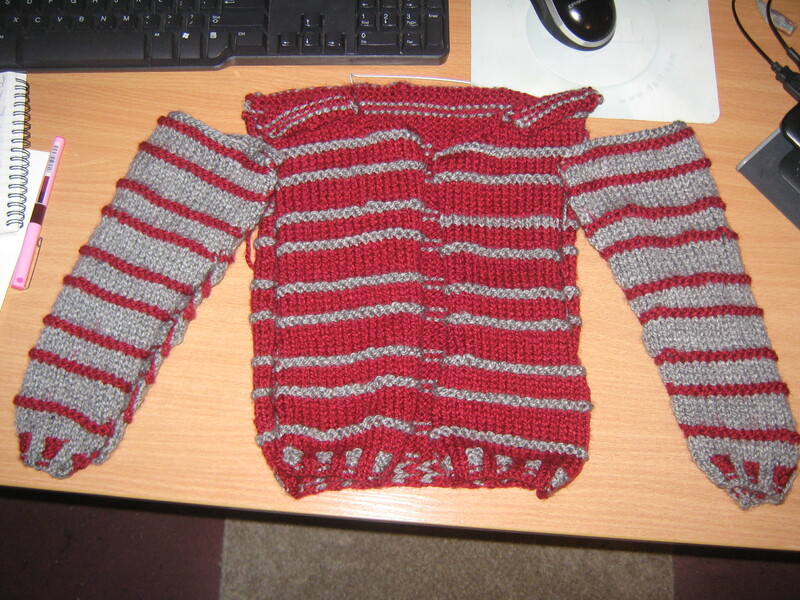 But the main bits are done, and as the pattern said — I have leftover gray. I was dubious as to whether or not that was actually going to work out, hence wanting to jam on through and finish both sleeves. But yeah, there’s still a lot of work to do on it. Hopefully I’ll have it done to show off next week. If not, I should at least have a hat. My little girl’s best friend’s birthday party is next weekend, so I figured I’d knit her a nice winter hat. I’m slightly irked ’cause I couldn’t find a red in the requisite thickness locally, so I had to to a possibly dangerous thing — I set up a Deramores account. At least I caught the start of the aran (worsted) sale, and only bought myself four skeins. Two are top-ups of the colours used for this cardigan; I figure I should make a matching hat for my kiddo. 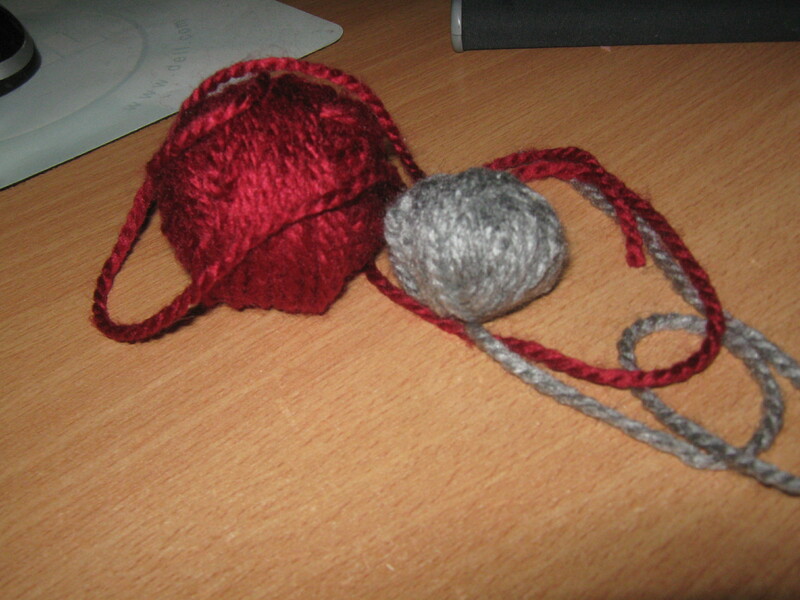 The other are two reds in aran, which I may or may not use for her friend’s hat. We’ll see how patiently I can wait, ha ha. I’ve got a nice variegated blue and a cream already, and those would look lovely together. I’d prefer to do a blue and red one though, so… we’ll see! Thanks! And I reckon knitting is better than not knitting, hee hee. As I’ve discussed with my friend Dee a couple of times, the knitting is so good for helping keep the brain happy. You said it! Unfortunately, I couldn’t resist some pricey stuff, and I’m extremely allergic to it. But there are wool blends and cotton/silk, and acrylics that look and feel like wool. It does a good job with the brain! I’ve been working with wool/acrylic blends lately. It’s easing me into not hating the touch of wool, and well… I do like a good acrylic, and the UK has loads of them. They make Red Heart feel gross to hands in the extreme.